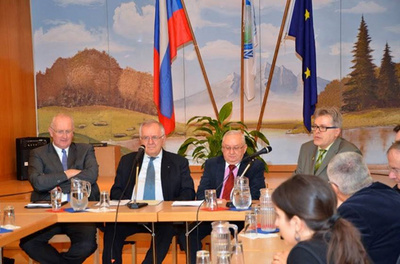 Recently an unusual event on the “Imperative of an EU-Russia strategic reset”, took place in Vienna, in the UPF Austria headquarters in partnership with IFIMES and its fiery representative Prof. Anis Bajrektarevic. I say unusual, as for one thing, the panel was composed by two megatons of political and diplomatic status; Dr. Walter Schwimmer, former Secretary General of the Council of Europe, and H.E. Anwar S. Azimov, former Russian ambassador to the OSCE HQ. But even more importantly, the audience was composed of a rare mix, raging from young students, women associations, interfaith dialogue groups, experienced professors and diplomats to high rank military officials and foreign attachés. The outcome was intoxicating; thanks to the inflammatory panel inputs and the reality-driven, hands on, questions from the audience. An amazingly rare openhearted, attentive, non-finger-pointing or bully-blaming and constructive discussion on what drives EU and Russia together. Or as H.E. Azimov noted: ‘in a constructive natural alliance rather than a strategic partnership’. Just 20 years ago, the distance between Moscow and NATO troops stationed in Central Europe (e.g., Berlin) was more than 1.600 km. Today, it is only 120 km from St. Petersburg. Is this a time to sleep or to worry? ‘Russia no longer represents anything that appeals to anyone other than ethnic Russians, and as a result, the geopolitical troubles it can cause will remain on Europe’s periphery, without touching the continent’s core’ – was the line of argumentation recently used by Richard N. Haass, President of the US Council of Foreign Relations. Is it really so? Is there any intellectually appealing call originating from Russia? Is it a lonely champion of antifascism and (pan-)Slavism? Is Slavism, identity, secularism and antifascism being abandoned in Eastern Europe, confused perhaps by the mixed signals from the austerity-tired Atlantic Europe and über-performing Central Europe? Consecutively, there were two statements on the table that they were the cause of awe and intellectual training. The one came from the H.E Asimov, when suggesting that ‘Russia was never against Ukraine joining the EU, but it was against letting this move harming the economic and defense related interests of Russia’. Pointing out actually, the reality, that a sovereign country cannot make a sovereign decision without consulting all natural and strategic allies. Then he went to add, that Russia in this case is simply a Mediator in the conflict; a mediator who sympathizes with the people of Southeast Ukraine. As for Krimea, the referendum and the accession that followed, it was just a matter of historical justice; and exerted the willingness of his country to generously participate in a funding scheme for the reconstruction of the post conflict Ukraine. That is beyond doubt a narrative that people in Europe have not yet been afforded the chance to hear, process and evaluate. On the other hand, Dr. Schwimmer, a veteran and master of diplomacy and proven enthusiast of the idea of Russia being viewed as a part of Europe, stated that he believes that Russia has not yet finished its transformation after the communist dictatorship. He illustrated the fact that Russia is, besides any strategic and geopolitical ideas, an indispensable part of the European culture and identity. Hence, when he made the provocative and pioneering hypothesis of Russia applying for an EU membership, he argued that the EU would have no grounds in rejecting it. Russia joining the European Union. That is definitely food for thought and subject of perpetual intellectual puzzle. Both sides have flaws in their communication strategies towards each other. Both sides have flaws in their communication strategies towards their own people. Both sides are inextricably interwoven in all possible aspects, from culture to economy. Dostoevsky is Europe’s favorite, Russian Christianity is putting Russia on a different list than, let s say, Turkey and 50% of Russian trade occurs with the EU; and these are only tiny examples of a long list of reasons suggesting not only natural alliance but true unity. Nonetheless, this idea seemed to shock everyone. Why? Let us put things into perspective. Ukraine. An interesting aspect of the Ukrainian conflict is its multidimensional character; as it started as an intra-state social struggle and along its evolvement it transformed to an inter-state conflict. The interaction between parties caused new issues to emerge or single issues to create multiple issues. Imagine the tensions in the form of a tree. On the roots of the Ukrainian conflict tree lie: 1) the weak Ukrainian state as a solidified democracy with clear goals, and means to achieve these goals, that enjoy the respect and support of the majority of the people; something that provides the ground for foreign interference; 2) the economic impoverishment of the Ukrainian people, that fuels social unrest; 3) the differentiated perception of history, as well as the, as such perceived, cultural differences of the Russo-phones and Galatic groups of Ukraine, that makes centrifugal powers within the society possible; and 4) the long history of inharmonious diplomatic relationship between Russia and the West, and especially the US. The latter aspect is illustrated by what many see as a culmination of many years of grievances with what Putin sees as an unfair international system. "They say we are violating norms of international law … It's a good thing that they at least remember that there exists such a thing as international law – better late than never,"2 said Putin. Adding to this irritation is also a sense of injustice and unfair victimization from the west that has long been a feature of Russian political thinking. Sochi is a recent sore point. The 2014 Winter Olympics was Putin's pet project, costing $50bn (£30bn), yet the build-up was permeated with noise about gay rights and security concerns from the west, and only a handful of heads of state visiting the games. On the leaves of the tree lie: 1) the different form of communication and political conduct between Russia and the West (the Kremlin does not like win-win solutions. It likes outcomes in which it wins, and its detestable Western rivals lose; and the EU finds this notion of geopolitics old-fashioned and unappealing, when geo-politics are happening on its doorstep); 2) the financial dangers for all parties from further escalation and consequent destabilization of the region; 3) the crippled alliance between the US and the EU, as the fallout from Edward Snowden’s leaks of secret material from the National Security Agency has weakened the transatlantic alliance. For the time being, everything seems as a dead end. For the time being, the EU seems trapped between the US and the Russian narratives. For the time being, Russia fails to see Europe independent from NATO. For the time being, the EU fails to find a constructive way to deal with Russia, forming a holistic approach that has a perspective of decades to come and be consistent to it; no wonder though, as the EU faces existential threats itself. The idea of unity is out there though, and time shall come that Russia will not be an ‘outlaw-most wanted’. Everyone has flaws, but it does not mean that the world should be deprived of them; not just like that. Ms. Patsea’s article on a possible reset of EU-Russia relations is quite challenging and worth an in-depth dialogue and response. I had already read the article in Modern Diplomacy which unlike Ovi does not have a comment section by which to exchange ideas with the readership. I myself in fact am on the Editorial Board of Modern Diplomacy, but in any case, allow me to take advantage of its re-publication in Ovi, which does have a comment section for dialogue, to point out a few observations and refelctions as a way of a much needed dialogue on this issue. In the first place, what Walter Schwimmer and ambassador Asimov are proposing is quite logical and sound: the problematc is not so much political or economic, but primarily cultural. Even on a purely geographical basis Russia, up to the Ural Mountains at least, is European, but the cultural ties are even more undeniable. Ms. Patsea correctly mentions religion and literature which by themselves would make the case for a potential entry of Russia into the EU. The Winter Olympics in Russia are rightly mentioned as indicative of where the problem lies. Indeed, Dostoyevsky and Tolstoy belong to European culture but unfortunately European culture has become enamored of Machiavellian politics. That was well displayed at the Olympics in London where the opening scene was that of train (symbol of inevitable progress and modernity?) arriving on the scene spewing forth pollution into the atmosphere and heralding the Industrial Revolution. Turning Matthew Arnold on its head the message seemed to be this: it is not Shakespeare that makes England great but coal and the industrial revolution which leads to political and economic power. To put it in more 21st century terms: it is oil and economic and political and military power that makes a nation great or lack of those, irrelevant. Those hard realities need to be soberly pondered by the EU leaders as they contemplate making Russia part of the EU. Perhaps the very first step is for them to read Matthew Arnold on what makes a polity great and so disabuse themselves of their overall political myopia. For indeed Putin may have a wholly different idea in mind: annexing the whole EU part of Russia which he considers a more pure and genuine culture not degraded by decadent Western cultural influences, especially those emanating from the US. That would beat even Stalin's Soviet Union's aims. The problem ultimately is this: how do we make Machiavellian power politics irrelevant for today’s political realities and put culture center stage in a positivistic, materialistic Western culture which while it pays lip service to the humanities and liberal arts pursues Machiavellian power politics? Do the likes of Matthew Arnold still have something to teach us about true greatness and “sweetness and light” and the importance of culture? I am afraid that as long as those kind of Machiavellian politics go on, the inclusion of Russia into the Western cultural framework will remain a mere imaginative Utopia.